Racial oppression continues in Portland because those in power lack humane, internalized and comprehensive value structures. ‘DoJ’ of course refers to the U.S. Department of Justice, Civil Rights Division. Portland City Commissioner Fritz argues that justice can be compartmentalized. When cops search a person’s home for an individual, they are quick to seize on evidence of other crimes. It’s an expansive application of justice, based on what is discovered. Fritz’ conceptualization of justice is confining. It’s morally lazy and intellectually incurious: the outer limits of her concerns are formed precisely … by whatever civil rights she’s been caught violating. McCarthy and Huspek took it upon themselves to arrest, handcuff and remove from her home a 9-year-old African American child. The little girl was separated from her mother, taken downtown, booked, photographed and fingerprinted, while dressed only in a swimsuit and towel. (See Washington Post umbrage here.) The men did not possess within themselves an ability to discern the propriety of their own conduct: they had been granted permission by civil authority to wield power in this manner … and so they claimed it. McCarthy and Huspek’s conduct is revealing, in light of a proposed plea deal in the pending case, USA v. City of Portland. A year and a half after collaborating with the DoJ to avoid trial and simultaneously give police enhanced roles in assessing mental health needs, the City leaves unchecked psychologically damaging police practices. McCarthy and Huspek likely remain oblivious to the trauma they induced in a formative mind. These officers emerge from a police culture that has never been held accountable for racial justice by political leadership. When Fritz telegraphs she’ll look the other way on race-based oppression, people of color rightly tense up … deeply concerned for the children’s well being. For local authorities, ‘justice’ is often the exercise of prerogative according to some external gauge. Their reasoning often considers the lengths to which they can exercise power without experiencing negative consequences. The culture of both Portland City Council and their Police Bureau suffer from the absence of an internalized, moral backbone. Neither can discern what is morally ‘right’ from what is legally permissible. When higher authority (in the form of the DoJ) narrows the field of legally permissible use of force, City Commissioners fence people of color away from remedy. Racial stigmatization and oppression will continue unabated. It matters little that Fritz was not telling the truth. The City’s proposed Agreement does mention race in three places. Two are admittedly insignificant phasing civil rights bureaucrats insert pro forma, but Item 148 in the Agreement mandates PPB document racial data when we become “subjects of police encounters.” It does matter that City Council is circling wagons, to ensure a proposed Community Oversight Advisory Board will confine itself to mental health issues for the next five years. $5,000,000 in new money will go to cops; and city administrators expect us to continue ignoring bias-based policing. No Commissioner challenged Fritz’s false assertion. The 2012 Agreement called for the Human Rights Commission’s (HRC’s) moribund Community Police Relations Committee to finally “work to implement the 2009 Police Plan to Address Racial Profiling.” (Agreement Item 146.) It is now 2014 2016, and CPRC has not begun to begin the work. CPRC’s refusal to address racial profiling arises just as much from the condition that no one in higher authority actually requires it, as it does from the body’s police-centric structure. Fritz held the HRC in her portfolio in her first term: it is due to her lack of leadership that CPRC never got around to putting the brakes on ‘stop and frisk’ and other, equally troubling, racially disparate police practices … often directed at African American youth. Justice did not demand police roust a little girl. It allowed it. McCarthy and Huspek are not the first PPB officers to be caught demeaning children of color. Officer Chris Humphreys was videoed in 2009, firing less-often-lethal rounds at close range into a prostrate, 12-year-old, African American child resisting the grasp of a fellow officer. Humphreys himself had an unchecked history of violence when he set shotgun sites on the girl. He was one of three Portland officers and a county deputy (later hired by PPB Chief Reese), who stomped unarmed James Chasse to death in 2006. To avoid facing trial, the City paid about half of the $3,100,000 Chasse heirs received for the police homicide. It’s intellectually ‘just’ that no one admitted wrongdoing while handing our money over, to settle a Federal wrongful death lawsuit. It is legally ‘just’ that Multnomah County District Attorney Michael Schrunk failed to make any criminal case against his coworkers. 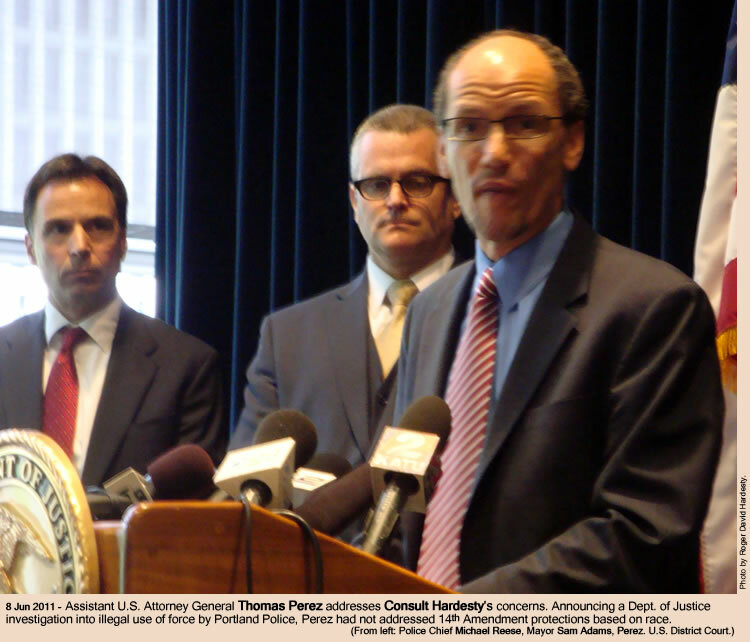 (Years later, PPB’s Use of Force Review Board heard testimony that – according to police policy – Humphreys should never have chased or knocked Chasse to the ground … let alone broken 26 bones … “because there was no evidence he committed a crime.” It was legal ‘justice’ when a state arbitrator ultimately reversed the minor suspensions Humphreys received in both the homicide and pre-teen’s cases. Given Portland’s history, of failing to hold Humpheys and his ilk accountable for repeated and eventually lethal brutality, McCarthy and Huspek could be expected to understand they can ‘shame and detain’ with impunity. We present these Human Rights concerns. • Psychological evaluations in police pre-hire processes do not screen for moral rectitude; to pass only candidates who have sufficient, innate character to appreciate what conduct is humane. • City accountability structures do not identify errant, serving officers, let alone sustain discipline for misconduct: they are unresponsive to citizen-initiated complaint. • Portland Police and City governance culture, predicated on avoiding detection and consequences, fosters and then reinforces uncivil behavior. • Any subculture – that shames and physically abuses with impunity – corrupts our social fabric; it psychologically wounds future generations and unnecessarily shortens life spans in victim populations. Had Fritz and City Council upheld their commitment to conduct even their initial annual review of the Police Plan to Address Racial Profiling (in 2010), they would have set expectations that racial injustice would be illuminated. The plan was intended to ramp up and improve data collection methodologies. Documentation would have made it more difficult for Federal investigators to subsequently ignore race-based civil rights abuses. In that they never saw to the plan’s implementation, it was as if Commissioners gave a green light to continued racial oppression. Settlement of civil rights violations is about race. Readers may find it ironic that African American pastors called the men from ‘Justice’ to town. 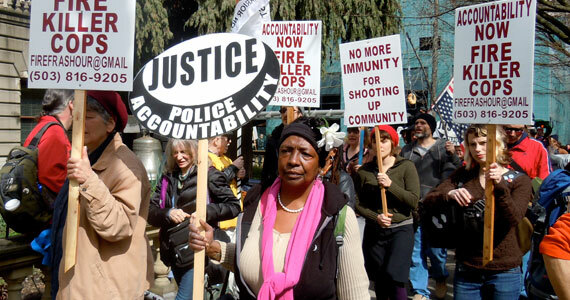 The Albina Ministerial Alliance re-established a Coalition for Justice and Police Reform after police killings went unchecked for years. Ministers repeatedly called upon the nation’s Attorney General to audit race-based policing. The City would not have faced prosecution for civil rights abuses if people of color had not demanded an end to them. His team in 2011 produced Findings which declared race outside the scope of their investigation. (Page 38.) In a February 2014 Federal Hearing, the DoJ put on the stand former Louisiana police Chief Charles Gruber. The police consultant testified he’d ignored the City’s own ‘stop data,’ which proves African Americans in Portland are twice as likely to be stopped, then twice as likely to be searched, and one-third as likely as whites to possess contraband or have outstanding warrants. Fritz can only admonish fellow Commissioners because higher authority refused to investigate race-based violations. You can be assured the DoJ did not look broadly into civil rights intrusions. They undoubtedly ignored intelligence gathering, and all Constitutional breaches fellow Federal officers routinely engage in: illegal surveillance, illegal detention (see Brandon Mayfield and U.S. Immigration and Customs Enforcement) and infiltrating the Muslim community to lure a young man into a concocted terrorist plot (see Mohamed Osman Mohamud). Simply because Federal authorities did not pursue these Constitutional breaches, you have no reason to think they are not ongoing. Simply because investigators ignored racial injustice is no substantive reason for a City Commissioner to continue avoiding remedy. Social justice is a far cry from civil justice. Jackson was not asking us to look away from racial inequity, as Fritz is attempting. In his expanded view of moral justice, a faith leader attempts to wrest conversation away from dry policy, and nearer to the humane vitality Dr. King described as Beloved Community. Because slave codes were written into law, they were not necessarily just. When City Council perpetuates racially oppressive police policies, they cannot be considered virtuous in anything but political jargon. The locus of authorities’ moral decision making is not internalized in Portland. Not by officers or City administrators. Portland’s City Auditor Lavonne Griffin-Valade oversees a structurally dysfunctional Independent Police Review Division (IPR). It is passive, like the CPRC; not seeking out malfeasance. It’s simply a cul de sac for survivors. Aggrieved individuals go there to obtain justice. When pressed by beleaguered community members on their own – most often solo – initiative, IPR does not investigate civilian complaints. They merely entertain police self-exoneration from the bureau’s Internal Affairs Division, and then duly inform victims that police accounts justify the conduct. Like CPRC, IPR is a buffer. It offers a pretense of addressing victims’ pleas, but in practice simply insulates local authority from having to face consequences for policies which harm minor constituents. Humphreys and fellow officers did not kill Chasse because he was mentally ill. They put their victim into a health crisis he did not survive. McCarthy and Huspek did not handcuff a child because she was a threat to them or others, rather their degradation engendered potential, psychic harm. Fritz’ claim did not clarify conditions: it set them. The arc of the moral universe. It will soon be five years since Fritz and her cohorts adopted a plan to address racial profiling. That the plan has never translated into policy is dangerous for people of color. It shows an absolute lack of will, on the part of civilian authority ceremonially in charge of police conduct. The plan’s abeyance is implied license to continue denigrating practices. Fritz’ latest assertion firms up City Council’s intention: since the Department of Justice chose not to catch Portland cops in race-based civil rights violations, we’ll let that be our reference point. 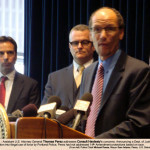 Adams was ordered to re-instate Frashour in 2012 – and restore full back pay – after PPB Training Officers testified before an arbitrator that their fellow officer had “acted as trained.” Such decisions do not climb to the level of determining whether it’s morally just to remove your earpiece and shoot in the back an unarmed man in the act of submission. Authorities simply decide whether use of force was ‘within policy.’ Policy is simply what we know to be the sanctioned, historical custom of police and officials in the nation’s fifth-whitest city. Before killing Campbell, Frashour evidenced his own history of “other questionable judgment calls involving the use of force.” City officials’ unwillingness to establish accountability mechanisms contribute to ongoing, abusive patterns and practices that have for years escalated to needless suffering and death. In moments spent choosing a right or wrong course of action, officers can be assured that, even when civil juries ultimately decide survivors should be compensated for unlawful brutality, no local authority will hold them personally accountable. I accept, as I must, that you are not willing to receive the title of press officer to the Meo for Congress campaign: it’s just the de facto situation, that you are writing my press releases for me. Yes Michael it would be difficult to watch Portland police and do press for a political campaign. I appreciate the vote of confidence. I appreciate this piece. I do think we need to realize that this isn’t about mental illness issues or race, it’s about the police. Let’s meet in the middle, Judith Mowry. It’s about mental illness, race AND the police … police brutality, police lack of accountability, police targeting and sweeping, police as punisher posse (not trusting the court to do so); police hired for being good liars and trained to become better [at deception], for being order-takers and then coerced to take more; for being loyal and finding themselves encased in a cone of silence. Mental health advocates say the hiring process for a Compliance Officer “has favored advocates more interested in addressing racial profiling. Those complaints have convinced Commissioner Amanda Fritz to lengthen the vetting process.” Theriault, Portland Mercury. Will Portland build a broad-based coalition, demanding police accountability, or will we let the perpetrators divide the victim population? Pingback: USUS Attack Strikes Portland! Perez also noted Mayor Adams, at the outset, hoped the investigation called for by faith leaders in the African American community would lead to improved relations between PPB and people of color.